Wow: In an amazingly publicised PR coup, the Czech Prime Minister Mirek Topolánek has - in an incredibly open chat with the European public - answered a massive amount of questions in an impressively long time period. In other words: Without large previous announcement (I only knew it through Brusselsblogger who inspired Kosmopolit to this post), Mr Topolánek has invested some minutes to answer 4 out of 43 previously recorded (and maybe filtered) English questions and 6 out of 22 Czech questions (English translation by Google™) without any possibility for spontaneous inquiries. This was no real chat, this was a very low amount of questions divided in two languages, and there was not much interaction with the public, as the discussion at Brusselsbloggers' blog rightly points out. The only good thing: It was online! Altogether rather disappointing, I might say. Gas supplies from Russia to the Balkans have now been cut entirely. Is this still an entirely commercial bilateral matter? when does the EU need to get tougher, how and with whom? Do you know yet why the Balkan route via Moldova has been cut? In this given moment, and based on our previous experience, neither the Czech Republic nor the European Commission wishes to act as an arbitor of this dispute. We are monitoring the situation and try to talk to all key players on both the commercial and political levels. The situation caused by the gas supplies having been stopped in the Balkans, Turkey, Macedonia and Ukraine is serious but not critical. The EU can at this given moment exert both economic and political pressure however it can assume a potential role of a moderator only if both parties agree to it and if it has all necessary information at hand. Medium-term and long-term solution lies in the diversification of supplies, higher guarantees provided on the level of the EU and the supplier themselves, bigger storage capacities, and alternatively substitutes being introduced in the energy mix, which overall translates in ... this very much complies with our key priority in the area of energy security. Dear Sir, Can you please give your position on the Slovenian blockade to the Croatian effort to join the EU? As you probably know, Croatia is willing to settle all outstanding territorial issues with Sloenia in the appropriate international courts. Can the Czech EU Presidency persuade Slovenia to do the same? I personally think that the approach to try solving this bilateral issue outside the EU is the correct one. Because it is no other than a biletaral issue. International Court, international arbitration or any other type of arbitration are the only possible solution. Our role during the Czech Presidency could be to try curbing the sharpness of the tension between the Slovenian and Croatian sides as regards the maritime frontiers and try to find a compromise which would work out for both parties as an acceptable solution in the context of their domestic politics. Both Prime Ministers, Mr. Pahor as well as Mr. Sanader are ready to conduct such a discussion. Dear Prime Minister, is the Czech Presidency concerned with the impact that the financial crisis can have on development and humanitarian aid? How are the activities foreseen in the EU consensus on humanitarian aid going to be funded? I do not think that the economic crisis on the global scale should have any major impact on the humanitarian aid provided by the EU. If this crisis is, more than anything else, the crisis of trust, the tools to repair the situation do not consist in either increasing or decreasing the humanitarian aid. This does not mean that either the UN or other multilateral bodies might not be faced with a situation demanding rapid and immediate action. It seems the unconditional US support to Israel is the only problem for a temporary stop of the Gaza war. Why is the EU not talking to the US about the middle east crisis? Talking to Israel only doesn't seem to make much sense. To twist the question around I would ask the following: what should be done about stopping the bombs being thrown from Gaza on the Israeli territory killing innocent citizens? There are no answers to such questions and the Czech Republic does not have the ambition to resolve the Israeli-Palestinian conflict which is going on for more than 60 years. The Quartet is the body which is responsible for dealing with this issue. It is composed of the UN, USA, Russian Federation and the EU. Our ambition is to reach a ceasefire in the respective area, to define the conditions which would be acceptable for both sides in order to conclude the ceasefire and with the help of the players composing the Quartet try to stop any military action as soon as possible. As far as the US standpoint on the right of Israel to defend its citizens, this is something I also believe in. Obviously, as far as the scope or the adequate measure of the response is concerned, that is a different question. Thank you for your questions, I am sorry as I have to attend to another assignement. But I will be back soon to continue this interesting chat. What will the Czech EU-Council Presidency do to raise attention of EU citizens for the European Parliament elections in June? Do you plan to make the work of the Council more visible and transparent? If yes, how? 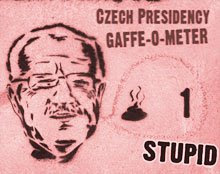 What a pitty, now I have to go to bed today without having interacted with the Czech Prime Minister...! You could have consoled yourself by reading the colective wisdom of their Work Programme (as I did instead). Well, Ralf, I could read their programme, but I wanted to hear it from Mr Topolanek personally. It's a difference having a Prime Minister saying something (even online) or having it in a polito-administrative document.